They’ve designed museums, galleries, international airports, and other public spaces. So when given the challenge to create indoor dog houses, these architects asked themselves how would a dog interact with a structure based on its size, eyesight, and how they see the world? All quite different, each dog house ranges from practical to fun. Architecture for Dogs was co-founded by Julia Huang, CEO of interTREND, a full-service communications agency. Julia was part of an all-day seminar organized by Purina on how life is better with pets. You can watch a video of Julia explaining how Architecture for Dogs works. Click on the name or picture of each design to look at the construction blueprints. 1. 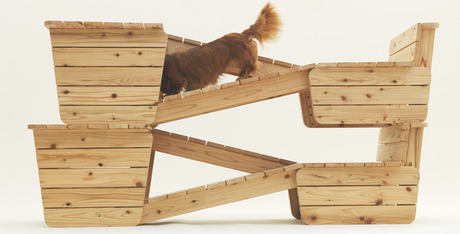 Architecture for Long-Bodied-Short-Legged Dog: Atelier Bow-Wow created this walkway specifically for long-bodied short-legged dogs. Their goal was that when a dog, like a Dachshund, is using it, he can meet his pet parent’s eyes. The architects left out stairs because Dachshunds and other short legged, long-bodied dogs can throw out their backs on steep steps. 2. Wanmock: A dog’s sense of smell is several times more powerful than our own. Knowing that dogs feel comfortable around the people they love, Torafu Architects created this hammock of sorts to capture your essence. Using one of your old T-shirts with your scent on it can put a dog at ease, and because of the size of this hammock, the structure works well for cats too. 3. Paramount: Mirror, mirror on the wall. Can dogs recognize themselves in the mirror? That’s what architect Konstantin Grcic decided to test out when he created this structure, dubbed “Mirror Test.” Grcic found humans are only able to first recognize themselves when looking in a mirror when they are between 18 months and two years of age. Dogs, on the other hand, don’t recognize themselves. 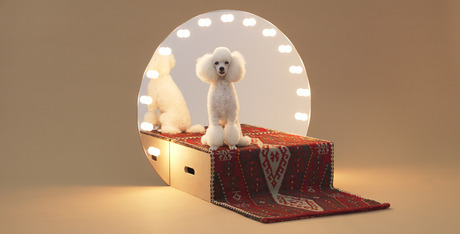 However, Grcic found a group of people who live with Poodles who disagree. 4. 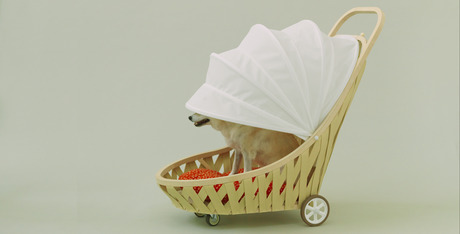 D-Tunnel: Architect Kenya Hara knows that dogs spend their lives alongside their humans. In this structure he created, he brings dogs together with humans on an eye-to-eye level. The height of this structure can be varied for different dog and human heights. 5. 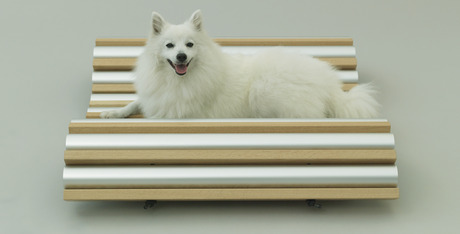 Dog Cooler: Hiroshi Naito created this bench with his beloved Spitz, Pepe. In Japan, the summers can get exceedingly hot, and Pepe, with all that fluffy fur, would pant. Inside the tubes are plastic bags filled with ice. 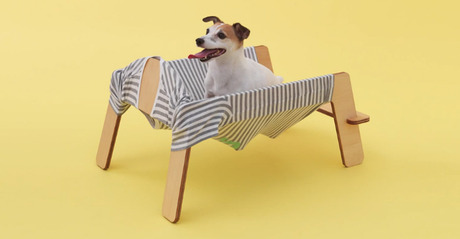 The wood slats allow the dog to get a firm hold on the bench and feel nice and cool. 6. 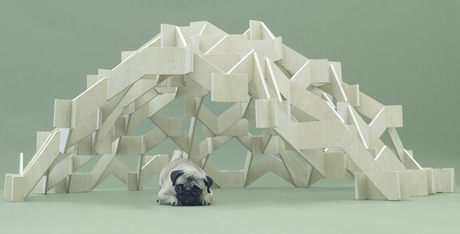 Mount Pug: Toys and snacks can be hung on this mountain designed by Kengo Kuma to personalize it and for fun. Designed for small dogs, this mesh-shaped house is assembled without nails or a bonding material. 7. 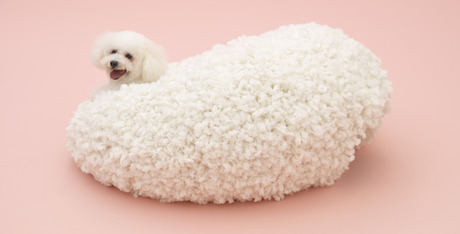 Architecture for the Bichon Frise: A Bichon Frise can be camouflaged inside this cocoon of sorts, created by Kazuyo Sejima. This sphere has a tunnel-like hole for the dog to enter. 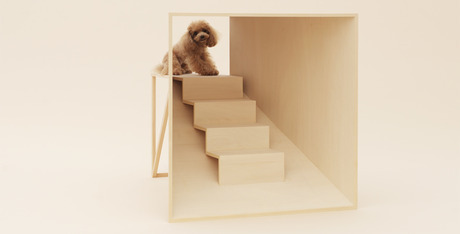 The aim here is that the dog and architecture become one unit. 8. 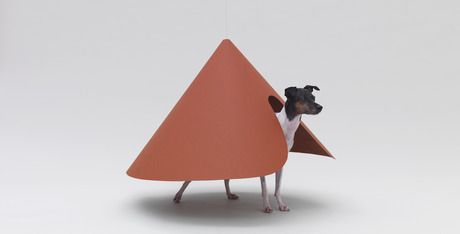 Pointed T: A floating house that travels with your dog from Hara Design Institute. Your dog can transform himself into a turtle by tucking in his legs and head. This is the easiest house to build. 9. 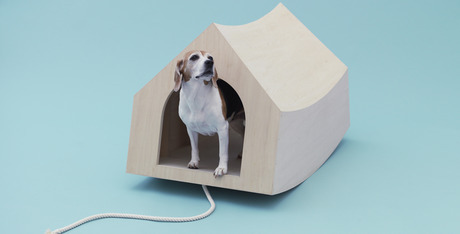 Beagle House: Updating a classic is what the architects at MVRDV decided upon when creating this space with Beagles in mind; actually, it was Snoopy, the Peanuts’ character that was the inspiration for this design. 10. 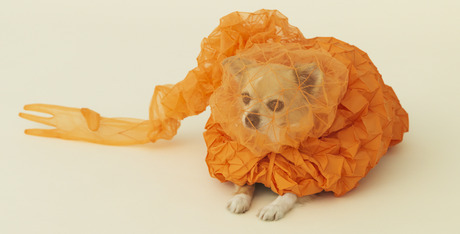 Chihuahua Cloud: Reiser + Umemoto wanted to give this dog a second skin that would protect it from the world around him. They see it as a buffer where a dog can hide and seek. The architects also like that this cloud-like material makes small dogs appear larger. 11. Paper Papillion: It’s a maze, a bed, and a chair — all in one. 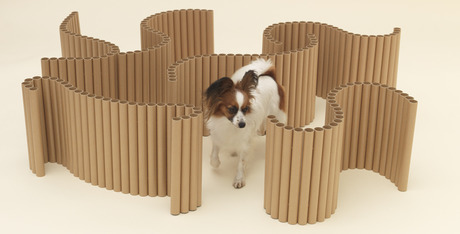 Made of cardboard tubes by Shigeru Ban, this is designed to be interactive for small- to medium-size dogs. 12. No Dog, No Life! From a garden (see the plants) to your dog’s favorite toys, this house within your house provides a soft boundary between people and the family dog. 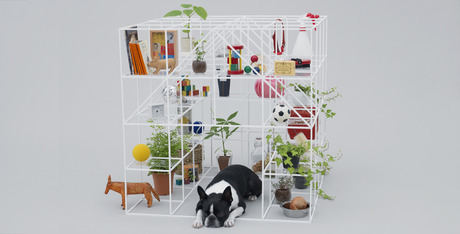 This house, designed by Sou Fujimoto, has places for your things as well as for your dog’s. 13. Mobile Home for Shiba: It’s a mobile home of sorts for older dogs whose legs have aged and joins may be sore. Designed by Toyo Ito, he knows that people love walking their dogs. However, when it rains, when the asphalt is hot, or if an elderly dog isn’t up for a long walk, this carriage-like shelter provides a graceful alternative to the outdoors.